New Domain Name, Same Great Website & Save Now! 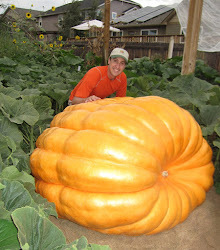 We are changing the domain name of this website from denverpumpkins.com to giantpumpkinman.com. The vast majority of my readers are outside of Denver, so to properly reflect that we are changing the domain name of the website. To celebrate the domain name change, we are offering 10% off your entire order on seeds.giantpumpkinman.com from now until March 6th. To get this offer just enter discount code pumpkin10 during the checkout. Take advantage of this great offer to stock up now. Spring is just right around the corner! It is with some sadness that I announce I won't be growing any pumpkins this year. It looks like we will be moving to just outside of Park City, Utah this summer. We love Colorado and have deep roots here, but an opportunity has arisen that my family doesn't want to pass up. I'll still be doing my website design business with my same development team, just relocating the headquarters. I'm also still planning on growing giant pumpkins and hope to setup a greenhouse this fall for growing. The altitude of my new home is about 400 feet higher than here in Denver. I'll be continuing my blog. My plan is to try to keep the clone plant that grew the 2008 Neptune going all summer and winter and use it as a pollinator next year. So I'll write about that and about starting the new pumpkin patch. I'll miss the great weigh-offs here in Colorado and the RMGVG community however, but look forward to meeting the growers in Utah. They seem to be a great bunch based on the movie that they were in.